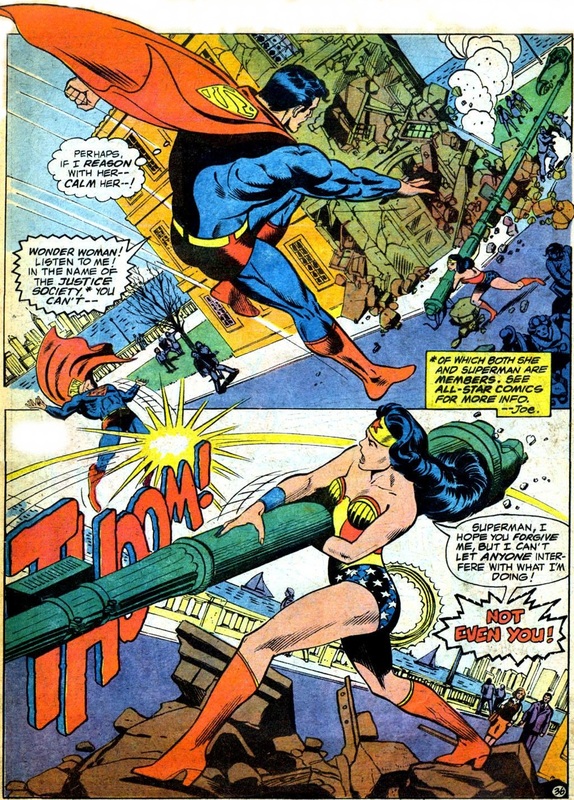 In the days before graphic novels, both Marvel and DC issued oversized ‘treasury’ editions, with DC being more ambitious by commissioning new content, such as this crowd pleasing battle courtesy of Gerry Conway and José Luis García-López in 1978. For some reason the superb draughtsmanship of García-López received more admiration from his fellow professionals than from fans, which is mystifying. 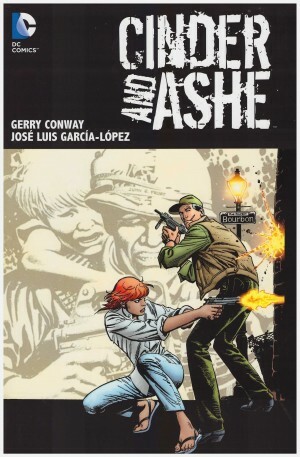 His name could never sell a project of the period in the manner of the also excellent Neal Adams, but García-López is every bit as good. His pages never have a poorly proportioned figure, odd foreshortening, lack of depth or any number of other technical faults afflicting lesser artists, and his layouts are superb. This isn’t his best work, being a little crowded in places, but there’s absolute storytelling clarity and when he lets loose, some mighty impressive art. In an era when the more conservative DC weren’t that keen on large illustrations beyond a splash page, García-López uses the large page size to deliver some beauties. 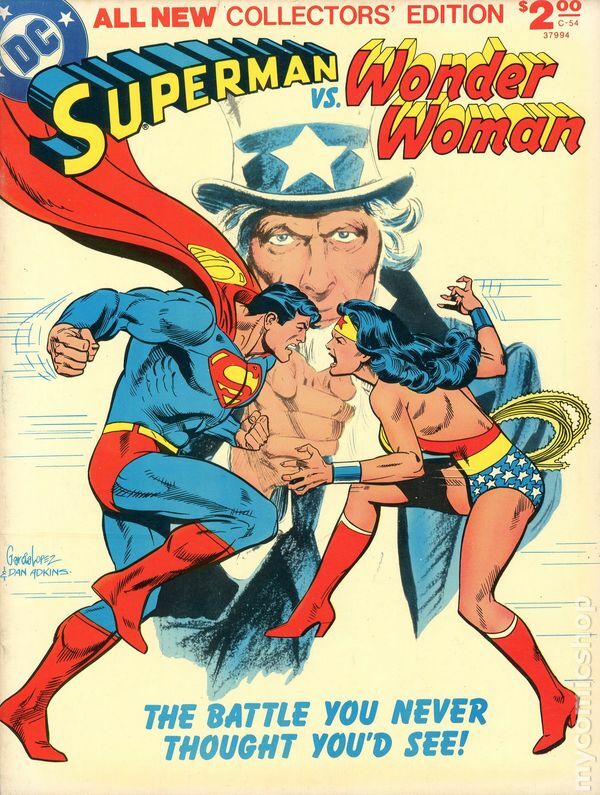 This story dates from when DC still considered Superman and Wonder Woman were actively fighting crime and Nazis during World War II, and presented as a recently declassified mission from that time with assorted reports illustrated by the artist. Both heroes find themselves stopping killings, and in the course of their subsequent investigations hear mention of the Manhattan Project, but enquiring about it results in tight lips and frosty stares. 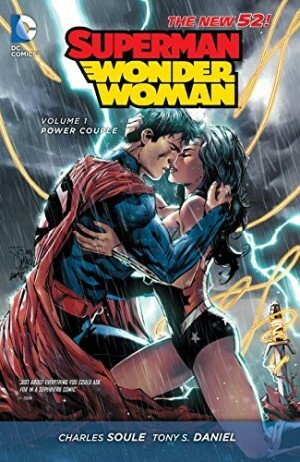 When Wonder Woman eventually discovers the truth, she’s appalled, and that’s what leads to the slugfest of the title. While Conway’s plot delivers on that and García-López brings it to stunning life, the logical underpinning is dashed off, with vast concepts thrown in for convenience. Superman and Wonder Woman fight on the Moon, and so they have stuff to throw at each other Conway comes up with an ancient civilisation that once lived on the moon. And guess what, they destroyed each other in a nuclear war. To call it over-egging doesn’t even start. The fight eventually breaks off into two fights against true villains representing America’s enemies of the era. Conway introduced armoured Nazi Baron Blitzkreig as an enemy for Wonder Woman the previous year, but he’s left to Superman, while Wonder Woman faces Sumo the Samurai. Despite the ridiculous name, he’s actually interesting, a specimen of human perfection via martial arts discipline that’s simultaneously enhanced his senses. Conway uses historical figures well, and delivers on the title promise. García-López isn’t quite at his most elegant, but that’s still better than nearly any other artist DC used at the time. Beyond that, however, don’t expect too much from a story that’s of its period. 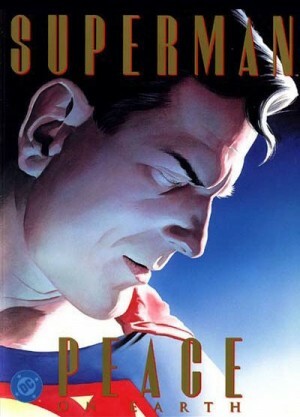 It’s also available at a smaller page size as the cover feature in Adventures of Superman: José Luis García-López.